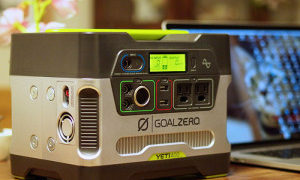 The Yeti 1250 Solar Generator from Goal Zero is a solid choice to power your small electronics, whether you are in the woods, on the jobsite or you are dealing with a power loss. 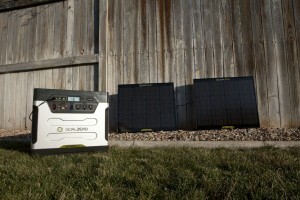 This power pack is an environmentally-friendly alternative to traditional back-up generators. From smartphones to refrigerators and everything in between, this gas – free 1250 Watt generator will take care of your energy needs. It is silent, safe and pretty easy to use indoors and outside. 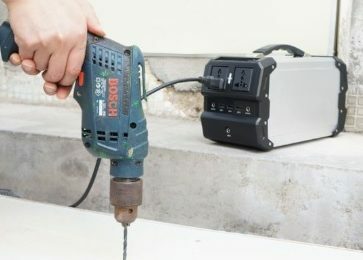 Whether it is for back-up power, camping, tailgating, or light duty construction, the Yeti 1250 generator gets it done. When you open the package you will find of course the Goal Zero Yeti 1250 solar generator, followed by 2 Boulder 30 solar panels, one fabric carrying case for panels and one roll cart. As you can see, the great thing is that the solar panels are included. This amazed me when I bought the generator. The dimensions are 11 x 16 x 14.5″ / 27.9 x 40.6 x 36.8 cm and it weighs 46.7 kg or 103 Ibs (bit heavy). It utilizes a 1200Wh AGM lead acid battery that can charge devices from smart phones and laptops, to televisions and small refrigerators. Since it uses a deep cycle battery, it works without noise and produces no exhaust. There are of course three ways of charging: With a wall charger (72W) it takes about 18 hours, with a car charger (30W) about 44 hours, and with the Boulder 30 solar panels about 40-80 hours. The front display panel provides readouts of incoming and outgoing power, and battery status in 20% increments. The Yeti provides an array of output options for any energy need. It has three standard 110VAC grounded wall plugs, three standard USB ports, a 12VDC car/vehicle port and two 6mm 12VDC plug ports. For additional battery power, the Yeti is chainable with other units(!). To be honest, I was skeptical about it at first… But when I opened it, and tested it, I was really amazed! It has a bunch of convenient plugs for charging things, plugs for receiving a charge, and a display to monitor battery charge. It powers all the devices mentioned in specifications and this is more than enough for me. All in all I am very pleased with this system and I would highly recommend it for anyone needing backup power. 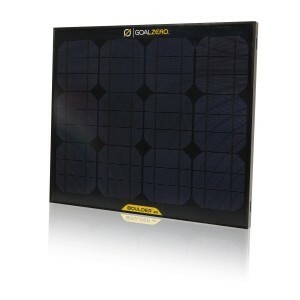 This solar panel collects 30 watts of power from the Sun to recharge your power packs. It is made of strong tempered glass with and aluminum frame for temporary or permanent installation. It has the ability to link panels together in order to maximize your collection of power and cut the recharging time in half. The Boulder 30 is waterproof and rugged terrain resistant and was made to last. It weighs 2.95 kg or 6.5 lbs. and has the dimensions 21 x 18 x 1 in (53 x 46 x 2.5 cm). The Boulder 30 can be used to power any Goal Zero recharger. 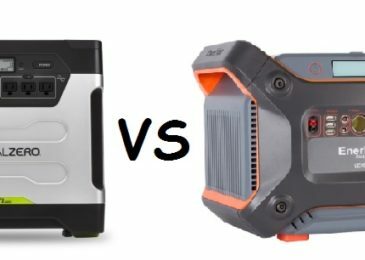 For the amount of Watts it gives, it will be most effective with the Escape 150, Yeti 150 – charges in 11-22 hours, Yeti 400 – charges in 26-52 hours, Yeti 1250 – charges in 20-24 hours, or Sherpa 50. 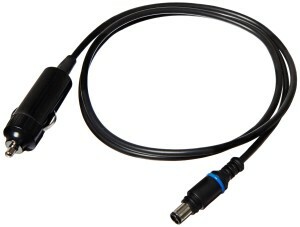 Its adapter is frequently bought with Yeti solar generators as well as Sherpa. It has the input of 8.0mm and output for a female cigarette. It weighs 2.4 ounces and the dimensions 6.9 x 6.5 x 0.8 inches. 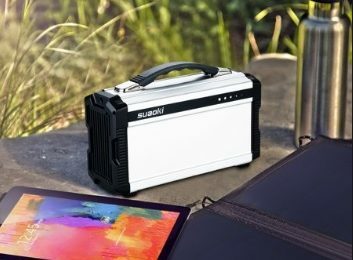 In my opinion this should come with the purchase of every Goal Zero solar battery because it is great for trips where you have time to charge the battery and need a source of power at your destination. 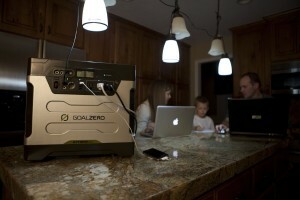 Goal Zero offers three different Yeti solar generators, depending on the amount of power that you need. But whether you choose the Yeti 150, 400 or 1250 you will not make a mistake! For all these solar generators abovementioned, it is crucial that you know it takes the same amount of time to charge your device from a Goal Zero power pack as it does from the wall. They are all solid, safe, and stable and could manage your energy needs.